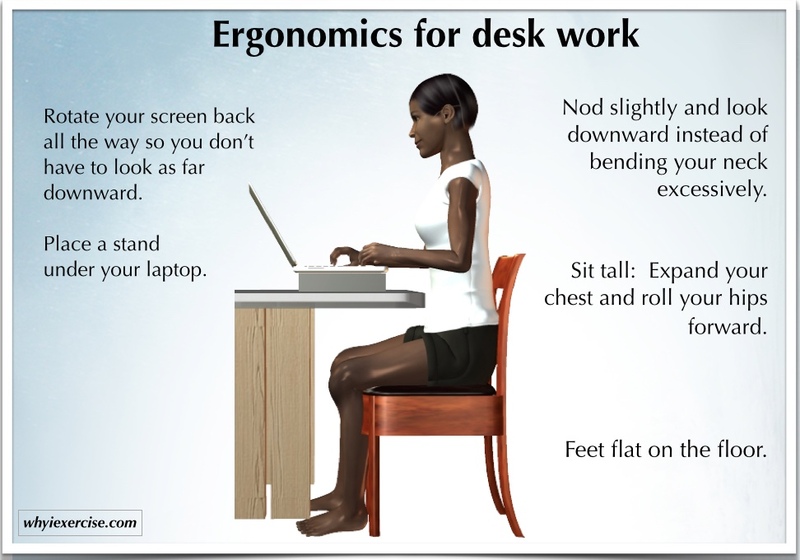 Ergonomics, exercises and physical therapy tips. Are you in need of a lower back pain remedy? You're not alone. Studies have shown that back pain is the 2nd leading reason that people visit a doctor (1, 2). If you want to relieve symptoms and avoid lower back problems, follow the 7 tips on this page. There are routines, activities and specific back exercises to keep you feeling better for the long term. For immediate pain relief, scroll to the end of this article. Please note: if you have an injury, medical condition, severe pain, or constant pain, please see your doctor or health care provider and follow their instructions. Set up your computer or laptop so that the top line of text is closer to eye level. Set up your keyboard so that your elbows are bent 90 degrees (forearms are parallel to the floor). Slide your desk chair close to the keyboard so that you can sit against the back of your chair. Sit with good posture. Tilt your pelvis forward out of the slumped position. Lift your chest so that your upper back is not rounded. Set your gaze straight forward to keep your neck in alignment. Then sit against the back of your chair. #2 Wear cushioned shoes and use a stool when standing prolonged. 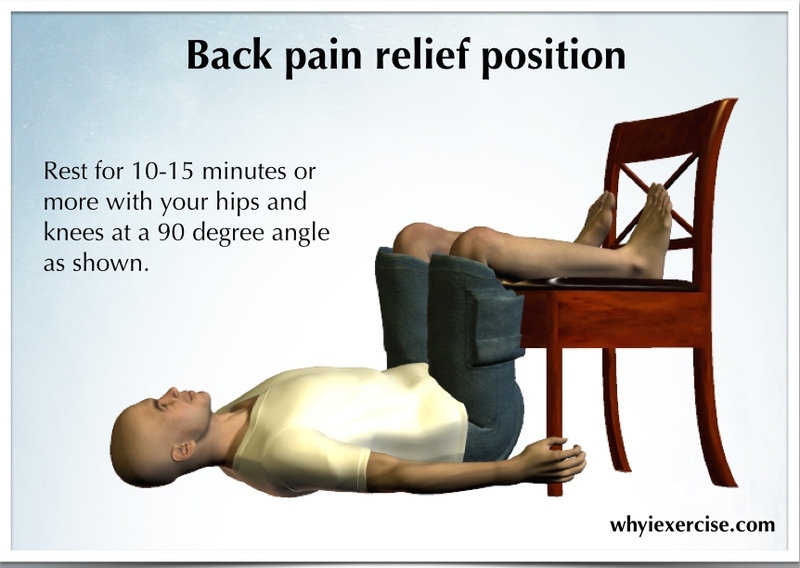 (a) One easy and helpful lower back pain remedy is to put one foot on a stool, especially if you will be standing still for a long period of time. This will ease the pressure on your back. Standing with your feet further apart (hip width) and with a slight bend in your knees can also be helpful. (b) Buy some well cushioned running shoes to wear when you’re standing. These shoes have the best technology to help absorb the load from your body weight. Go to a running shoe store where a specialist can match your foot type to the proper shoe. 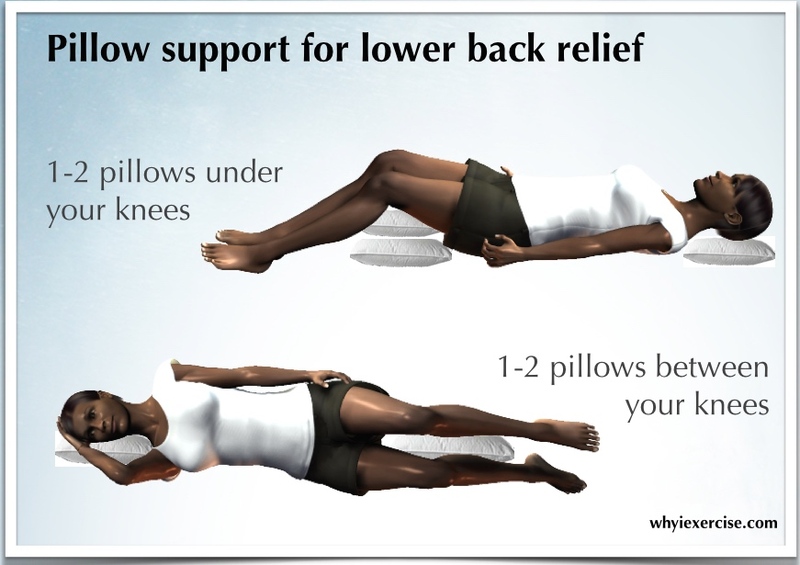 If you like sleeping on your back, placing 2 pillows under your knees will lessen the extension or arching of your lower back. If you prefer sleeping on your side, place 1-2 pillows between your knees. This will keep your hips in a neutral position, as you can see in the picture below. #4 Take stretching breaks at work. You can also relieve stiffness during the work day by taking short breaks. Stand and stretch every 20-30 minutes. 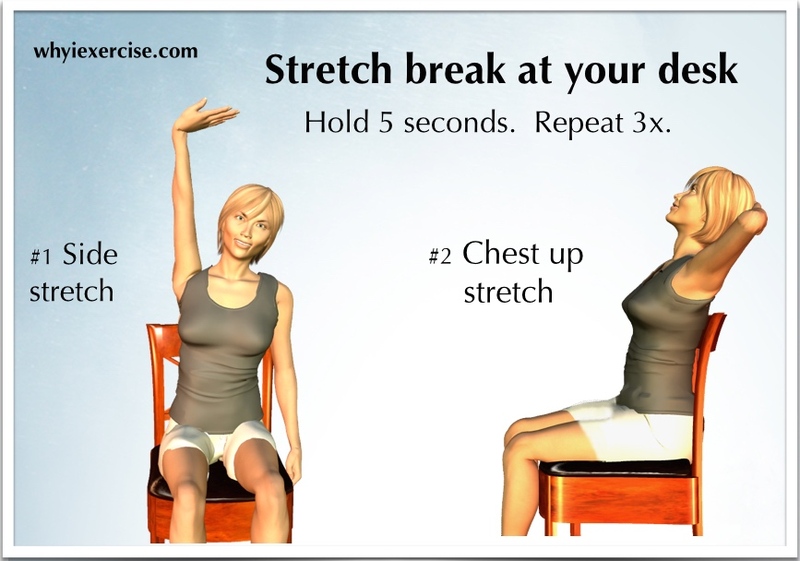 The stretches below will relieve stiffness from prolonged sitting during your work or school day. Stay upright (maintain good posture) as shown in the pictures to get the most out of the stretches. My back stretching exercises article shows you more stretches for the back plus hip and hamstring exercises. #5 Get up and walk to get the blood flowing in your back and hip muscles. Though many of us need to sit still for much of the work day, our muscles and joints want to move! For starters, try walking briskly for 5 minutes at least twice during the day. Also consider being more physically active when you aren't at work. Exercise before you start the day or as soon as you get home. Each workout will relieve muscular stiffness with a boost of circulation. Staying active is not only good for prevention of back problems, it allows you to recover faster from an episode of lower back pain (3, 4). My free workout plans article shows you how to use activities you enjoy to gradually build up to the level of activity you need for good health and fitness. When you are more fit, you tire less easily and you are more likely to maintain good alignment of the spine (and avoid straining positions) during any physical activity. #6 Strengthen your back and core muscles. When you have strong torso muscles, it's much easier to maintain good spine alignment and avoid strain or injury. See the article on back strengthening exercises. In summary, stay active, stretch, develop good strength in your back and core muscles, and maintain good support and alignment of your spine. Combine these tips with the immediate relief position below, and you have an excellent lower back pain remedy. Lie on your back with your legs supported in a chair as shown. Adjust the chair so that your knees point straight toward the ceiling at a 90 degree angle. This position takes pressure off the spine and discs. Note: If you have severe pain, constant pain, or pain from an unknown cause, please see your doctor. 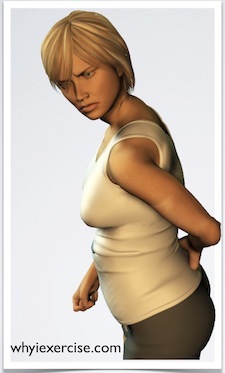 The info on this page is intended to help prevent serious back problems. A lower back pain remedy is not a replacement for proper care from your doctor or other health care provider. Return from lower back pain remedy to Why exercise?